This policy is current and valid from 19 November 2012. This site is an online magazine that has been founded by Maria Vlezko (‘the Founder’) in November 2012. Materials available on this site are protected by copyright law. Copyright © 2012-2016 SoNailicious. All rights reserved. See our Copyright section for more information about the use of site contents. The views and opinions expressed on the site are honest and unbiased. If the Editor claims or appear to be expert on a certain topic or product or service area, they will only endorse products or services that they believe in, based on their expertise, are worthy of such endorsement. Any product claim, statistic, quote or other representation about a product or service should be verified with the manufacturer or provider. This product/service was provided by brand/PR for consideration. Brands, retailers and their representatives (such as their PR agents, marketing affiliates, and so on) send a product for consideration. Consideration means that the product is sent/service is provided to us so we can try it and determine whether it is a product we want to showcase on the site. We make all decisions regarding when, how, and if it is even mentioned on the site. We do not accept compensation for our product reviews and we do not do paid positive reviews. This post is brought to you by. Sponsored articles are specific articles that we have received compensation for. It can be a sponsored giveaway, topical content or advertorials. We do not endorse or review products for compensation. Only products that we personally tried and loved will be recommended to our readers. Products with no disclosure statements were purchased by the Founder, Editors and/or Experts. We’re always looking for new beauty products to feature. However, only products and/or services that are of interest to our readers will be featured on SoNailicious.com. If you have any products or services which you believe our readers will be interested in, please contact editor (@) sonailicious.com. We do not accept payments for reviews because we can not guarantee products provided for our review will receive positive reviews or will be featured on SoNailicious.com at all. The Editor reserves the right not to feature the product if they believe the product does not meet certain requirements. Please note that we do not publish reviews and/or can guarantee a review and/or a feature on the site in exchange for a free product. In the event you wish your product to be returned, you’re welcome to collect it from our office. We do not provide return shipping services for products sent to us for consideration. At this stage we only accept paraben-free and cruelty free beauty products, as well as 3-Free, 4-Free and 5-Free nail polishes & nail care products for reviews. All reviews are written based on the Editors’ personal experience with the product and is not influenced by third parties (advertisers, PRs, etc.). All products are tested in the ways and for as long as necessary to properly test a product. Each product is tested and reviewed based on the claims the product makes. We prefer to use our own descriptions and derive our own conclusions rather than using those provided by the brand/PR. We review products in full and provide our own unbiased opinion. Our readers will be informed about both, positives and negatives (if any) of the products. If you see a review that’s all positive, that means we found nothing negative about the product. We use our own SoNailicious Review System to help readers to guide through reviews and understand our recommendations. Please see below for further details of The SoNailicious Review System. Product reviews are done in a timely manner on a ‘first in, first out’ basis. Currently our lead time 4-6 weeks for regular products and 2-3 weeks for seasonal collections. All advertising is in the form of advertisements generated by a third party unless otherwise stated as advertisers. We also accept advertorials – advertiser/brand written content. We do not do sponsored product reviews. Sponsored post can be done in form of a sponsored giveaway or topical content. All advertorials and sponsored posts will be disclosed and marked accordingly. For more information on advertising and sponsorship options available within the site please see Advertising section or email us directly at info @ sonailicious.com. This feature was added in June 2013, so the articles prior to that will not have it. SoNailicious Recommends is an award granted by the Editor to particularly remarkable products and the recommendation is subjective. We look at the product quality, efficiency, how well it performs and how unique it is, as well as if it is of a great value. It’s basically us saying, we love this product so much we want you to try it too. Formula: We look at how fast drying and well pigmented the formula is as well as whether it is 3-free, 5-free, vegan or not. Application: We look at how easy it is to apply the polish for a flawless look, e.g. how evenly it goes on the nails. Finish: Glossy, shimmering, sheer, metallic, etc. Brush: We look at how easy it is to use the brush for a flawless application of manicure. We look at bristles quality and thickness. 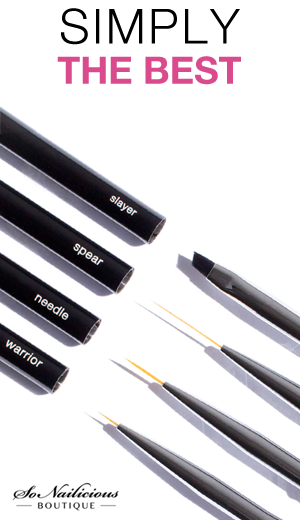 Some brushes allow to apply polish in one stroke, others are so thin you’d need three. Longevity & Wearability: We look at how well a polish performs over time. For nail polishes, we test for how long it goes chip free. Nail Art: We look at what types of nail art techniques are best suited for this particular polish. 3-free or 5-free: We’re looking at ingredients to identify whether nail polishes and treatments contain the Big 3 toxic chemicals – no Dibutyl Phthalate (DBP), Formaldehyde and Toluene and 5 Free – no Dibutyl Phthalate, Toluene, Formaldehyde, Formaldehyde Resin, and Camphor. This part was added on 3 June 2013, so the earlier posts will not have it. Specific Qualities: The product can be tested against specific claims it’s press release makes (e.g. 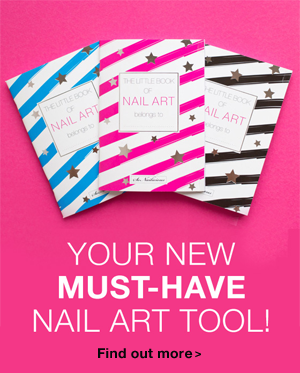 “Dries in 60 seconds”) or specific qualities that are important to this particular nail product (e.g. “fitting” for nail wraps). Overall Impression: Our conclusion about the product where both positives and negatives are outlined, as well as specific recommendation for use are given. Should you have any questions or comments about the SoNailicious product review policies and disclosures, please contact us here or email directly to info (@) sonailicious.com. Last Review: 1 June 2016.